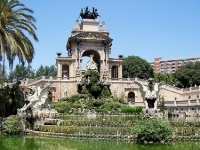 Located in the centre of Barcelona, the Parc de La Ciutadella is a great place to spend a sunny summer's afternoon relaxing under a tree with a book, a picnic and the family. Originally the site was chosen for a fortress in 1714, but in 1869 it was decided that the area should be a park and the palace was demolished. Featuring a lake where visitors can hire a small rowboat, exploring the park and being out on the water is a fun way to unwind. The paths for walking, jogging and cycling are wide and well-maintained, and there are plenty of park benches and shady areas. There are some interesting sculptures dotted about the park and some striking buildings. The Cascada is a giant water feature designed by Fontsere with some help from his student Gaudi. The Catalan Parliament building is in the park, as is the Barcelona Zoo and the Castle of Three Dragons, which now houses the Zoological Museum. The Geology Museum, housed in an imposing neoclassical building, can also be found in La Ciutadella. The enormous, red triumphal arch, Baroque in design, marks one entrance to the park. Apart from being one of the best places in Barcelona to sit and people-watch, there is a lot to see and do in the Parc de La Ciutadella.